Ethorse, HORSE, has been in circulation since 17th January, 2018. 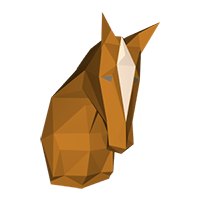 It works separately from a central bank and cannot be mined for a profit like other coins, so therefore, to get HORSE, you must buy it via an exchange. Ethorse was the first ever Ethereum Smart Contract based DApp (decentralized application) for betting on the price of Cryptocurrencies. You can bet on BTC, ETH and LTC. If you think a coin is going to rise, bet on it to win more. Ethorse can be found online, on social network sites like Telegram, Facebook, Twitter, Medium and Reddit. We don't have any exchanges listed for Ethorse yet, check back soon! We don't have any wallets listed for Ethorse yet, check back soon! We don't have any debit cards listed for Ethorse (HORSE) yet, check back soon! We don't have any price charts listed for Ethorse yet, check back soon!